Evidence shows that cat foods packed with corn, wheat, and other grains contribute toward the development of certain diseases and conditions in cats, including feline diabetes, allergies and obesity. Excess weight in cats packs a double whammy, since fat cats are prone to arthritis as well as diabetes. Cats are obligate carnivores, after all, and really don't need carbohydrates in their food. A few commercial cat food manufacturers, recognizing these trends, are producing wholly grain-free dry cat foods for healthier cats. Listed here are several grain-free cat foods. 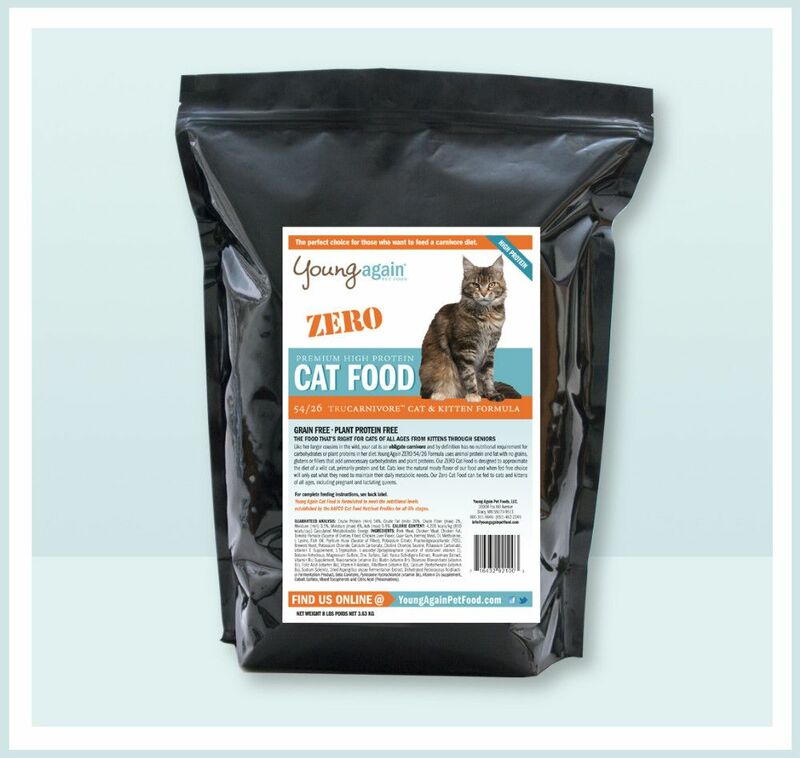 After reading a glowing reader's review of Young Again, I ordered a bag directly from the manufacturer for my own cats. Billy, Jenny, and especially Jaspurr, were overweight, and I was concerned for their health. Ingredients: Hydrolyzed Pork, Chicken Meal, Chicken Fat, Chicken Liver Flavor, Tomato Pomace (source of dietary fiber), Guar Gum,Herring Meal, DL Methionine, L Lysine, Fish Oil, Psyllium Husk (source of soluble dietary fiber), Potassium Citrate,Fructooligosaccharides (FOS), Brewers Yeast, Potassium Chloride, Calcium Carbonate, Choline Chloride, Taurine, Potassium Carbonate, Vitamin E Supplement, L-Tryptophan, L-ascorbyl-2polyphosphate (source of stabilized vitamin C), L-Carnitine, Betaine Anhydrous, Magnesium Sulfate, Zinc Sulfate, Salt, Yucca Schidigera Extract, Rosemary Extract,Vitamin B12 Supplement, Niacinamide (vitamin B3), Biotin (vitamin B7), Thiamine Mononitrate (vitamin B1), Folic Acid (vitamin B9), Vitamin A Acetate, Riboflavin (vitamin B2), Calcium Pantothenate (vitamin B5), Dried Aspergillus oryzae Fermentation Extract, Dehydrated Pediococcus Acidilactici Fermentation Product, Beta Carotene, Pyridoxine Hydrochloride (vitamin B6), Vitamin D3 Supplement, Cobalt Sulfate, Mixed Tocopherols and Citric Acid (Preservatives). Pork Protein Concentrate, Chicken Meal, Poultry Fat (Preserved with Rosemary Extract, Mixed Tocopherols and Ascorbic Acid), Soya Oil, Fish Oil, Herring Meal, Cellulose, (Source of Dietary Fiber), Fructooligosaccharides,Natural chicken flavor, L-Lysine, Guar Gum, DL Methionine, Coconut oil, Yeast, Yeast extract. CALORIE CONTENT: 4,205 kcals/kg (610 kcals/cup) Calculated Metabolizable energy. I previously reviewed Blue Spa Select Cat Food. That food is relatively high in grain content, including brown rice, oatmeal, barley, and rye. Blue Wilderness is completely grain-free. Also, the Life Source Bits are a very dark blue in color, and my cats eat them along with the kibble. First Named Ingredients: Chicken (Deboned), Chicken Meal, Potato (Dehydrated), Turkey Meal, Chicken Fat (preserved with mixed tocopherols – a source of Natural Vitamin E), Sweet Potato (Dehydrated), Dried Egg, Natural Flavor, Yeast Culture, Dicalcium Phosphate, Lysine, Sea Salt, Alfalfa, Salmon Oil, Choline Chloride, Acai Berry (Dried), Blueberry (Dried), Yucca Schidigera Extract, Rosemary Extract, Taurine. First Named Ingredients: Turkey, Chicken Meal, Chicken, Herring Meal, Chicken Fat, Peas, Egg, Turkey Meal, Pea Fiber, Natural Flavors, Apples, Carrots, Cranberries, Herring Oil, Tomatoes, Pumpkin. Consult with your veterinarian before switching to Innova Evo or any other food if your cat is under treatment for any serious condition.